Man, every time the Supreme Court seems to be forgotten about for a while, it comes roaring back to the fore and shakes things up. This time they really did it, overturning key campaign finance limits, which will allow corporations and unions to spend unlimited sums of money to influence elections. Talk about judicial activism. Hey, and it was another nail biter. Okay, not really. It split predictably along ideological lines. Yup, another 5-4 ruling! Maybe 5-4 rulings should just not count. Make it like a veto: two thirds majority. 6-3 or bust. By the way, can the justices make some more public appearances, please? For one, it seems like they make these huge declarations and then hide behind the curtain Wizard of Oz-style. Moreover, the once-annual footage of them coming out for a class picture in full robed regalia is almost as worn out as that clip of Bill Clinton hugging Monica Lewinsky. 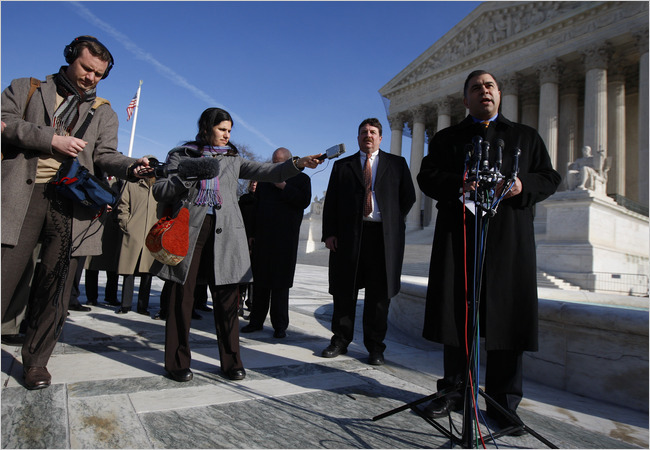 Today’s ruling, Citizens United v. Federal Election Commission, is the judicial equivalent of a 20-yard loss and it’s going to be felt almost immediately. It reverses important components of the McCain-Feingold law (officially called the Bipartisan Campaign Reform Act of 2002), two important related rulings, and “a century old-understanding,” as The New York Times put it, that imposed sensible balances on organizations affecting elections. Am I missing something? Do the special interests not already have enough power? Are they not lobbying and throwing millions around behind closed doors to great effect? You need only look at the health care, climate change, and financial reform legislation to see their impacts. We need some stare decisis up in here! Was this not settled law? I mean c’mon, it was bipartisan! Doesn’t that count as the same thing? Is this merely a First Amendment issue? Wasn’t that defense well addressed at the time of these other statutes and cases? What fundamental, inalienable right awards a corporation the same rights but even more clout than an actual person’s? No doubt, the Supreme Court has been a crucial check and balance through the ages, when one of the other branches gets a bit carried away. Arguably, it’s the branch of our government with the least self-interest. Its members are not worried about reelection or what people think of them. The Court’s rulings have always been to look out for us and define gray area, but more and more they seem to be extracting broad, sweeping changes from obscure, niche scenarios. In this case, Citizens United made a film that was pretty much a hate letter to Hillary Clinton during her presidential campaign, titled Hillary: The Movie. I’m almost as upset about the ruling as I am about that title now being usurped from my biopic screenplay starring Annette Benning. The case hinged around the documentary’s free availability on certain cable providers’ video-on-demand sections. That is pretty narrow. I wonder how many people watched this thing there: 50, 60? Yet, as a result, now Republicans and Democrats alike will be able to hit up corporations and unions like crazy to lobby on their behalf in the midterm elections and beyond. (Technically, the organizations cannot donate to campaigns directly, but can still coordinate to say whatever they want in favor of or against a candidate.) I suppose this means candidates will ask us for less, but that’s ridiculous. It’s gonna be the Wild West. And the individual citizen will only be able to afford a knife at the gunfight. What public or societal good will come from this? What good comes from allowing corporations to spend freely now? Especially with the myriad forms of advertising and advocacy organizations can avail themselves of now (Internet, text, e-mail, etc.). Were Obama, McCain, and Hillary not raising enough cash to flood the airwaves and Wi-Fi hotspots with content? For his part, Obama released an excoriating statement on the ruling and vowed to do something about it, though I’m not sure what that can be. A Congressional committee will also hold a hearing in order to enjoy the sound of its own voice. You may say that the public will be on the lookout for this influence now, but most people are not that aware. Furthermore, the moneyed interests are not stupid. They know how the public thinks of them. That’s why they coordinate and make clever ads like the one below. It’s aired on cable news networks during the health care reform debate to try and make viewers feel the plight of the working mom in an effort to persuade the public against taxes on soda and sugary juices. Listen, working moms can’t afford an ad-buy. The ad purports to be representing everyday families scrapping just to get by, but was made by American Against Food Taxes, a coalition of beverage manufacturers and restaurants chains. Take a look at their “ordinary” members. Now imagine dozens more ads like that slyly working to sway your opinion of Obama, Palin, Romney, Reid, Joe Sestak, Mike Pence, whoever. Listen up, Supreme Court. We already had plenty of news to digest today. John Edwards sent a friend to admit he’s the father of Rielle Hunter’s child while he tried to redeem himself in Haiti. Obama threw down the gauntlet against big banks (and tanked the markets). Health care reform remains in limbo with Scott Brown’s win. Conan cashed out of NBC way before he wanted to. So, SCOTUS, next time you want to drop a big one on our laps, pick a slow news day. And make it good news. I agree with you on this one, Ross. And I must say, I never agree with you on anything. I am all for campaign finance reform, but I’m not sure what it should look like yet. Pols raising money is one check to make sure they should even be in the election, but at the same time, the current system gives way too much power to interest groups. Nice win for Brown the other day! The people have spoken. McCain-Feingold was pretty obviously unconstitutional from the start. “Is this merely a First Amendment issue?” you ask. Yes, it is. The Constitution does not give the federal government the ability to supress ads it doesn’t like or ads it doesn’t like the timing of. Kennedy’s opinion states “”The government may regulate corporate political speech through disclaimer and disclosure requirements, but it may not suppress that speech altogether.” Those interested in protecting the 1st amendment should cheer this decision. Obama doesn’t like it because up until now Democrats had the edge in campaign donations. Take a large corporation. The unionized employees of that corporation were free to donate to Democrats … just as their shop stewards and union leaders suggested they do. The company itself? Prohibited. The Democrats are afraid that large businesses that are traditionally more attuned to the pro-business Republicans than they are to the pro-union Democrats are going to tip the balance of power here. Now you know why Obama is upset. D “The E” Q, your agreement has profoundly touched my heart. Our robust First Amendment still includes practical, prudent safeguards for indecent and obscene speech due to their questionable value to the public good. My concern about this Supreme Court ruling is also one of public good. The sour taste in my mouth from this ruling is not at all partisan. Democrats and Republicans are both quite corporate, and furthermore, up until the 2008 presidential election, Republicans did a far, far better job of raising money (see Bush’s 2004 campaign war chest of $200 million, about double Kerry’s http://bit.ly/coUi9R). Lastly, there is theory and there is practice. In practice, those disclaimers and disclosures get hidden or tacked on quietly at the end. Corporations have shown themselves to be plenty strong and influential. They have a sensible vehicle for this already: PACs. Whose voice is stronger in Washington: yours or a PAC’s? And whose voice will be stronger tomorrow: yours or a Fortune 500 company? Samples & Shapiro: “Before McCain-Feingold, both (corporations and unions) could spend freely on advertising about candidates for federal office. Such spending made up a relatively small part of election-related speech, and no one group dominated … the political arena” (http://tinyurl.com/yjnjqsa). Concerns about wild corporate/union interference in elections are unfounded scaremongering. One more thing…there is a simple way to get corporate money out of politics if that is a noble goal: reduce the governments role in our lives and economic affairs (i.e. smaller government). If government has no favors to sell, no one will spend money trying to win them. Our current government sells favors right and left in the form of the “stimulus” bill, “green jobs”, and the pork-laden budgets. I see, Ej. By the way, are you as turned on right now as I am?